I demonstrated at the San Diego County Fair on Saturday. 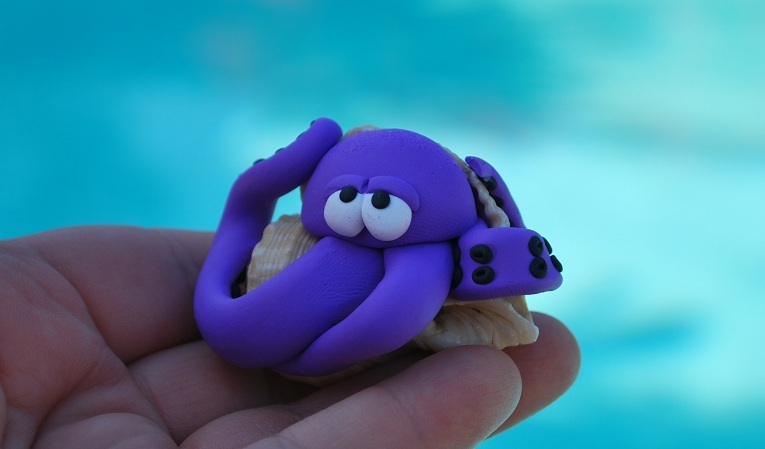 The San Diego Polymer Clay Guild Has done that in the Home and Hobby section of the fair for years. It is fun to show people what the clay is all about and talk with the visitors. We let them make a bead if they were interested. Then they could come back after we had baked them and take them home. They all seemed very excited about doing it. Most of them couldn’t wait for them to finish baking and cool off. We had to give their bead in a paper towel because it was still hot from baking…. These little birdies are new in my Etsy Shop. They are actually in with the one listed as a necklace WHOO is purple, these are the others available upon request. 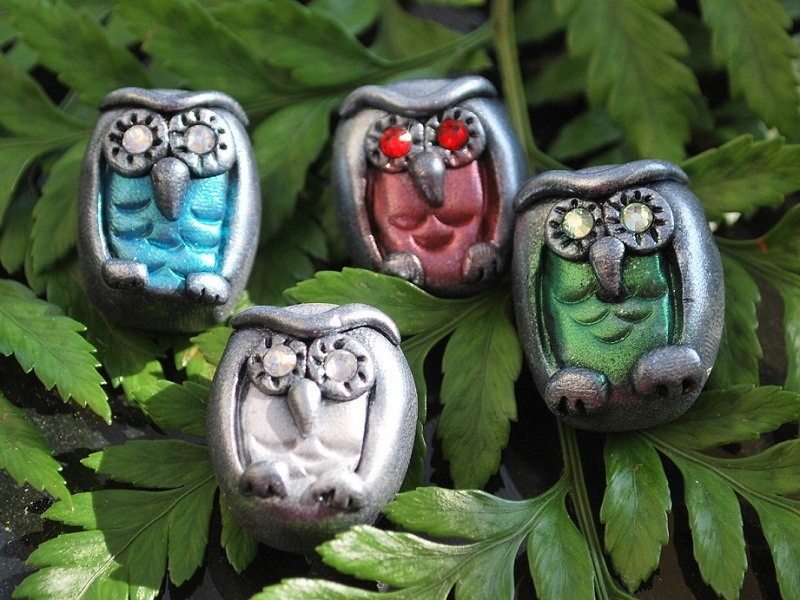 I think Nikki did a great job making these owl beads. Yeah, I let her sneek ’em in. She’s trying to make enough money to go to Warped Tour to see her favorite bands. Soon it will be hot summer days, swimsuit season and no hiding from it. Yes, I do! 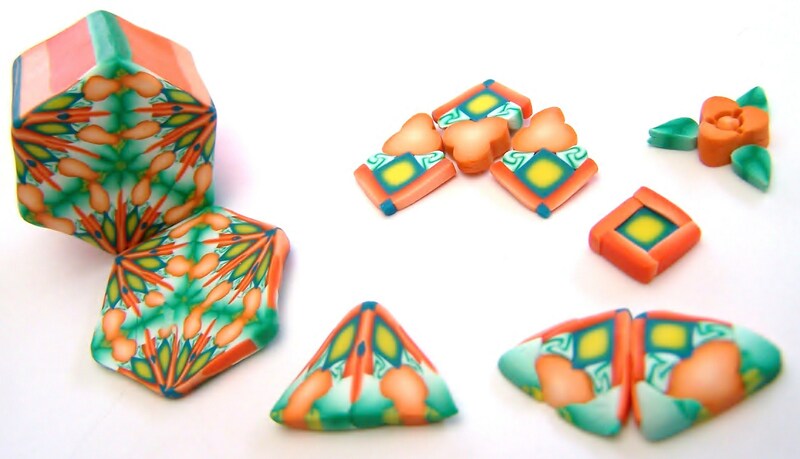 Lots of POLYMER CLAY CANDY CORNS! 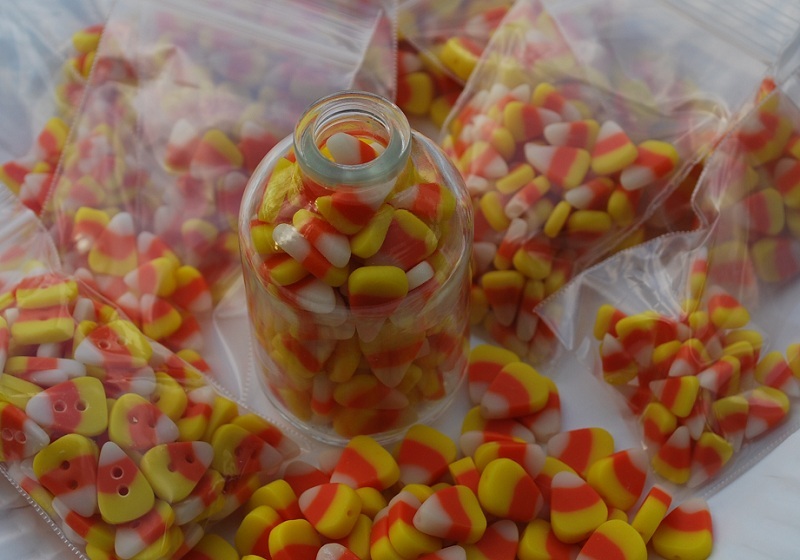 Still on my candy kick, I’ve been working with Halloween colors. I need to be ready when the holidays hit. So far, I have itty bitty no hole corns, small corns with holes running across, medium corns with holes across and some vertical, large corns with vertical holes. I should have taken the picture before separating the different kinds, sorry, I am not letting them get mixed up again! I made these using Cernit brand polymer clay, I think it looks the most like the real thing! I bought the clay from Clay Factory Inc. in Escondido. I used white porcelain, orange and lemon. Whew, that’s a bunch! … or is it a bushel? This should be fun! 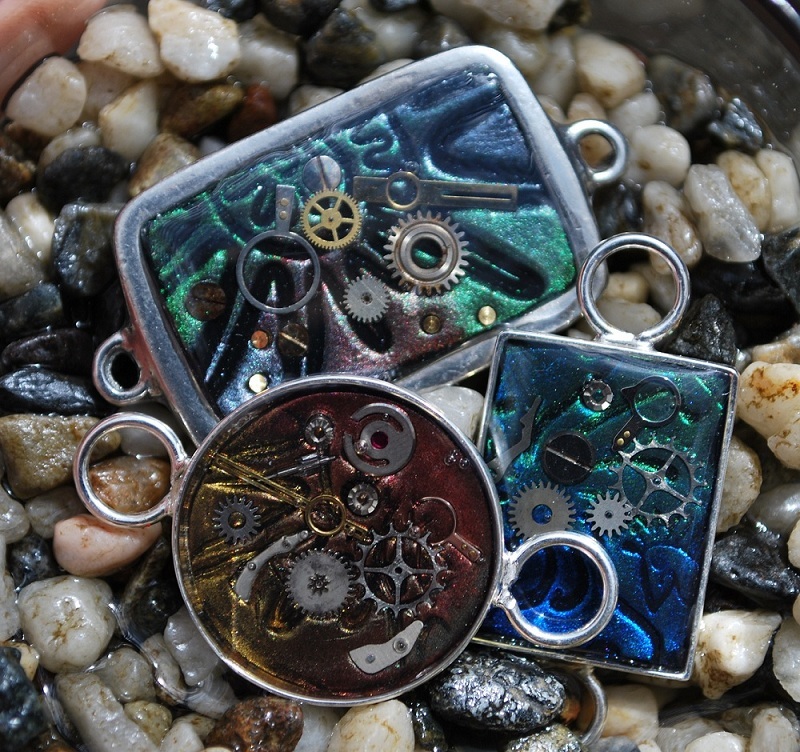 I am going to have a steampunk class at The Bouncing Bead. It’s a great bead store in La Mesa, CA. I shop there more than my hubby knows…shhh. They have lots of goodies that make me drool. I put up the times and dates for this under the tab Events/Classes. Wow ! Thanks a bunch E.C. Look what we got a “Versatile Blogger Award”! That is very nice for you to think of us. We like making stuff up and posting it for the world to see, or at least those of you who read our blog. We are supposed to post 7 Random facts about us. Thanks for giving us this award E.C. We appreciate it! http://fimofanatic.wordpress.com/ Charlene A.Therien Aka: CAT She has a very funny blog and links to all her other fabulous sites.